If theres one thing that is a certainty, in the Patriots locker room, you make news on the field and not in locker room. Devin McCourty didn't do anything wrong but he commented on a TMZ report that the Patriots may be interested in signing Colin Kaepernick. Both the Patriots and Raiders have been rumored to have interest in the quarterback even though he hasn't played in almost two years. The Patriots were mentioned because Geragos was asked about a "Colin Kaepernick anthem" that rapper Meek Mill is planning on. "I've heard that," Geragos said. "You know who Meek Mill was visited by when he was in custody?" Geragos' question was then replied to with Patriots owner Robert Kraft. Geragos then replied back with "Bingo." Kraft's connection to Meek Mill isn't a direct correlation to the Patriots signing Kaepernick however if there is an owner to bring him back into the league Kraft makes perfect sense. McCourty talked about how he feels that Kaepernick deserves a spot in the league. "I would just say I think he's a really good player," McCourty said. "I think he's had a tremendous amount of success in this league. And I've said it numerous times, there's no doubt in my mind that he's one of the top -- whether you want to say 32 or 64 -- quarterbacks that should be in this league. McCourty also sees Kaepernick doing good things for his community. Kaepernick donated one million dollars to many different charities over the past year and a half. "I think he's still doing positive stuff," McCourty said. "I think him as a player would probably spotlight some of those things. Because right now people only talk about still the same thing. If he had that viewership, as far as the NFL, people would get to see what he does. I love this decision. 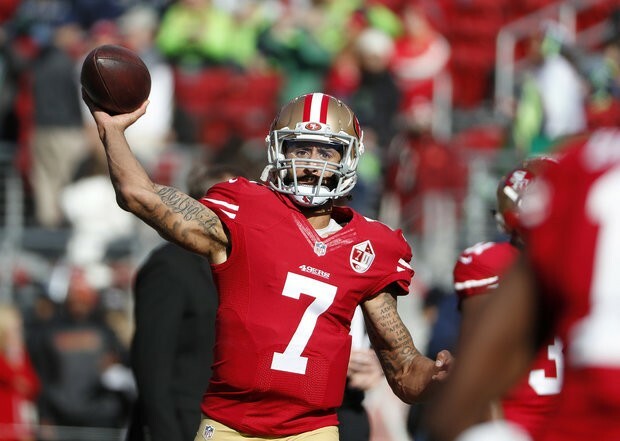 Not only do I think that Colin Kaepernick should be in the NFL as a backup, he should be a starter. Theres no doubt in my mind that Kaepernick has the talent and the intelligence to be a starting quarterback in the NFL. You're telling me that quarterbacks like Marcus Mariotta, Tyrod Taylor, Josh Allen/Nathan Peterman, Sam Bradford and even Eli Manning will give you more of a chance to win a game than Colin Kaepernick? Preposterous. Kaepernick would be a great addition to the Patriots. Why? Because Kaepernick is a very good quarterback who with a good coach has the ability to win the MVP and win a super bowl. Kaepernick has had awful coaches in his time in the NFL and the year that he did have a good coach, Jim Harbaugh, he went to the super bowl and just barely came up short. He had a completion percentage of 58.4%, he also threw for nearly 3200 yards and twenty one touchdowns that season. To me I think Kaepernick is a no brainer. I love everything about him. His resiliency, his lack of fear to do something he believes in, and not to mention his football skill. Kaepernick is no ordinary quarterback and its a perfect match because the Patriots aren't an ordinary organization.